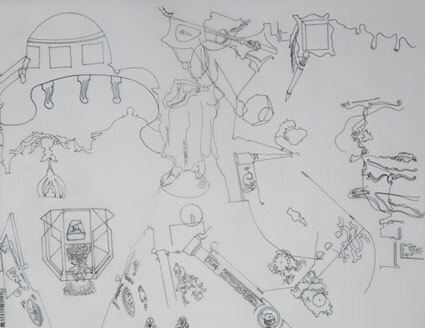 The drawing above is one of a series of works on paper that Christian Edwardes has been working on, towards an exhibition organised in partnership between the Russell-Cotes Museum and The Arts Institute at Bournemouth. The Russell-Cotes drawings are part of a larger investigation into the possibilities of developing a cartography of imagined and utopian spaces. Starting from smaller sketches done whist walking through the building (detailing architectural features as well as objects and furniture), the larger drawings are then composed into a more complex image (remembered and imagined) of the space previously mapped during the walk.